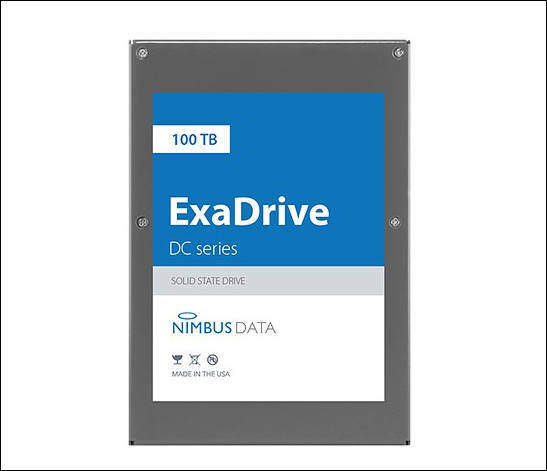 Irvine, CA, March 19, 2018 -- Nimbus Data, a pioneer in flash memory solutions, today announced the ExaDrive® DC100, the largest capacity (100 terabytes) solid state drive (SSD) ever produced. Featuring more than 3x the capacity of the closest competitor, the ExaDrive DC100 also draws 85% less power per terabyte (TB). These innovations reduce total cost of ownership per terabyte by 42% compared to competing enterprise SSDs, helping accelerate flash memory adoption in both cloud infrastructure and edge computing. "As flash memory prices decline, capacity, energy efficiency, and density will become the critical drivers of cost reduction and competitive advantage," stated Thomas Isakovich, CEO and founder of Nimbus Data. "The ExaDrive DC100 meets these challenges for both data center and edge applications, offering unmatched capacity in an ultra-low power design." Featuring the same 3.5" form factor and SATA interface used by hard drives, the ExaDrive DC100 is plug-and-play compatible with hundreds of storage and server platforms. The DC100's low-power (0.1 watts/TB) and portability also make it well-suited for edge and IoT applications. The DC100 achieves up to 100,000 IOps (read or write) and up to 500 MBps throughput. This equally-balanced read/write performance is ideal for a wide range of workloads, from big data and machine learning to rich content and cloud infrastructure. "The release of such a high capacity flash device that is fully compatible with HDD form factors opens up the opportunity to turbo charge big data platforms while at the same time improving reliability, significantly reducing device count, increasing data mobility, and lowering the TCO of multi-PB scale storage platforms," said Eric Burgener, research vice president of Storage at IDC. "Devices of this class will allow flash to cost-effectively penetrate a broader set of use cases outside of tier 0 and tier 1 applications."